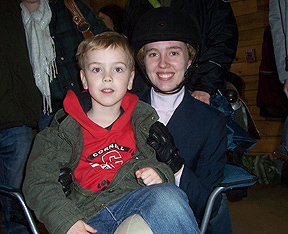 Seen here with "Ogi" (pronounced "Ogg-ee"), Cornell University sophomore Elizabeth Briggs was second in her section of advanced walk-trot-canter. By making the top two, Briggs was invited back for the advanced walk-trot-canter Championship Class, at which time she again placed second. Cornell as a team was first, scoring 41 to defeat Dartmouth by five. The Class-by-Class results of the 2009 All-Ivy League Championship Horse Show, Co-hosted by Yale University and the University of Pennsylvania and held at Volo Farm in Westford, Massachusetts on April 11th, 2009. Only members of the Ivy League Schools (and those who graduated from them) are eligible to participate. Riders who placed in the top two in each section were invited to return for the Championship class for that division. Points earned in the regular classes and not the Championship classes counted toward the final team totals. The Judge for this event was Jay Sargent. Open Equitation On The Flat, Section A: 1. Caroline Shulman, Cornell University. 2. Allegra Aron, Brown University. 3. Danielle Stacy, Dartmouth College. 4. Kate Hopkins, Yale University. 5. Emily Kenyon, Cornell University. 6. Diana Greenwald, Columbia University. Open Equitation On The Flat, Section B: 1. Elizabeth Gilberti, Brown University. 2. Meredith Bock, Princeton University. 3. Candice Berne, Cornell University. 4. Lorena Passi, University of Pennsylvania. 5. Jennie Nevin, Yale University. 6. Brittany Blackstone, Yale University. Open Equitation On The Flat, Section C: 1. Katie Kuzinevich, University of Pennsylvania. 2. Samantha Parsons, Dartmouth College. 3. Nicole Finazzo, Cornell University. 4. Jill Ross, Columbia University. 5. Joker Arroyo, Yale University. 6. Elise Fishelson, Brown University. Open Equitation Over Fences, Section A: 1. Jill Ross, Dartmouth College. 2. Brooke Cagwin, Cornell University. 3. Joker Arroyo, Yale University. 4. Elise Fishelson, Brown University. 5. Samantha Parsons, Dartmouth College. 6. Kate Hopkins, Yale University. Open Equitation Over Fences, Section B: 1. Jennie Nevin, Yale University. 2. Allegra Aron, Brown University. 3. Caroline Shulman, Cornell University. 4. Dakota Gruener, Brown University. 5. Heather Sherman, Cornell University. 6. Diana Greenwald, Columbia University. Open Equitation Over Fences, Section C: 1. Lorena Passi, University of Pennsylvania. 2. Jessica Bemis, Cornell University. 3. Meredith Bock, Princeton University. 4. Brittany Blackstone, Yale University. 5. Georgina Melbye, Cornell University. 6. Elizabeth Gilberti, Brown University. Intermediate Equitation Over Fences, Section A: 1. Cristina Herren, Dartmouth College. 2. Rachel Griffith, Brown University. 3. Lauren Noble, Yale University. 4. Candace Berne, Cornell University. 5. Emma Clippinger, Brown University. 6. Claire Dube, Cornell University. Intermediate Equitation Over Fences, Section B: 1. Lauren Bookbinder, Cornell University. 2. Ilana Halpern, Princeton University. 3. Leona Rosenblum, Brown University. 4. Amanda Watson, Dartmouth College. 5. Laura McGarry, Columbia University. 6. Sophia Topulos, University of Pennsylvania. Open Equitation Over Fences Championship Class: 1. Jennie Nevin, Yale University. 2. Brooke Cagwin, Cornell University. Novice Equitation Over Fences, Section A: 1. Rachel Klion, Cornell University. 2. Mallory Ratajewski, Columbia University. 3. Sarah Spangenberg, Dartmouth College. 4. Linda Cummins, Dartmouth College. 5. Ally Langenfeld, University of Pennsylvania. 6. Emily Bourdeau, Brown University. Novice Equitation Over Fences, Section B: 1. Justine Gentilini, Cornell University. 2. Alaina Smith, Dartmouth College. 3. Monique Wolfe, Yale University. 4. Anne Chavent, Princeton University. 5. Caroline Rusk, Cornell University. 6. Rebecca McGoldrick, Brown University. Novice Equitation Over Fences, Section C: 1. Erica Anhalt, Dartmouth College. 2. Kathryn Eng, Brown University. 3. Sara Hilker, University of Pennsylvania. 4. Jennifer Grover, Brown University. 5. Sam Duxbury, Cornell University. 6. Monique Roberts, Princeton University. Intermediate Equitation Over Fences Championship Class: 1. Cristina Herren, Dartmouth College. 2. Ilana Halpern, Princeton University. Novice Equitation Over Fences Championship Class: 1. Rachel Klion, Cornell University. 2. Kathryn Eng, Brown University. Open Equitation On The Flat Championship Class: 1. Caroline Shulman, Cornell University. 2. Allegra Aron, Brown University. Columbia's Jill Ross (on left) won her section of open fences. 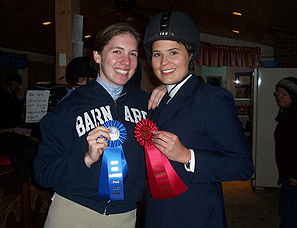 Lion teammate Mallory Ratajewski (on right) was second in novice fences not too much later. Columbia went on to finish in the middle of the pack, in fourth place a point behind Brown with 26. Intermediate Equitation On The Flat, Section A: 1. Zoe Samuel, Cornell University. 2. Rachel Griffith, Brown University. 3. Leona Rosenblum, Brown University. 4. Alaina Smith, Dartmouth College. 5. Brooke Cagwin, Cornell University. 6. Anne Chavent, Princeton University. Intermediate Equitation On The Flat, Section B: 1. Justine Gentilini, Cornell University. 2. Dakota Gruener, Brown University. 3. Laura McGarry, Cornell University. 4. Emily Bourdeau, Brown University. 5. Amanda Watson, Dartmouth College. 6. Ilana Halpern, Princeton University. Intermediate Equitation On The Flat, Section C: 1. Mary Winans, Cornell University. 2. Emma Bogdonoff, Brown University. 3. Cristina Herren, Dartmouth College. 4. Emma Clippinger, Brown University. 5. Claire Dube, Cornell University. 6. Sophia Topulos, University of Pennsylvania. Alumni Equitation On The Flat: 1. Jessica Schatz, University of Pennsylvania. 2. Diana Patterson, Columbia University. 3. Gillian Heinecke, Brown University. 4. Jess Nichols, Columbia University. Intermediate Equitation On The Flat Championship Class: 1. Zoe Samuel, Cornell University. 2. Mary Winans, Cornell University. Novice Equitation On The Flat, Section A: 1. Erica Anhalt, Dartmouth College. 2. Jennifer Grover, Brown University. 3. Melissa Kenny, Cornell University. 4. Sara Hilker, University of Pennsylvania. 5. Rachel Weinberger, Columbia University. Novice Equitation On The Flat, Section B: 1. Lauren Lavo, Cornell University. 2. Alana Munzenmaier, Columbia University. 3. Kathryn Eng, Brown University. 4. Ally Langenfeld, University of Pennsylvania. 5. Linda Cummins, Dartmouth College. 6. Abigail Owen-Pontez, Yale University. Novice Equitation On The Flat, Section C: 1. Sarah Spangenberg, Dartmouth College. 2. Monique Roberts, Princeton University. 3. Susanna Kurnick, Dartmouth College. 4. Monique Wolfe, Yale University. 5. K.L. Huang, Princeton University. 6. Rebecca McGoldrick, Brown University. Advanced Walk-Trot-Canter Equitation On The Flat, Section A: 1. Lucretia Witte, Dartmouth College. 2. Elizabeth Briggs, Cornell University. 3. Kari Lewis, Dartmouth College. 4. Morgan Taylor, University of Pennsylvania. 5. Colleen Brogan, Brown University. 6. Cara Rosenbaum, Brown University. Advanced Walk-Trot-Canter Equitation On The Flat, Section B: 1. Morgan Broccoli, Cornell University. 2. Kristen Aigeldinger, University of Pennsylvania. 3. Ashley Bockman, University of Pennsylvania. 4. Kiauntee Murray, Brown University. 5. Callie Lewis, Dartmouth College. 6. Nicole Wolfe, Yale University. Novice Equitation On The Flat Championship Class: 1. Sarah Spangenberg, Dartmouth College. 2. Erica Anhalt, Dartmouth College. Beginner Walk-Trot-Canter Equitation On The Flat, Section A: 1. Kelsey O'Shea, Cornell University. 2. Julia Caine, Columbia University. 3. Jena Tavormina, Brown University. 4. Helen Mou, Brown University. 5. Ji Min Kim, Cornell University. Beginner Walk-Trot-Canter Equitation On The Flat, Section B: 1. Kona Shen, Brown University. 2. Marissa Fuerst, Brown University. 3. Peng Deng, Columbia University. 4. Scotty Weber, Cornell University. 5. Brooke Peterson, Princeton University. Advanced Walk-Trot-Canter Equitation On The Flat Championship Class: 1. Morgan Broccoli, Cornell University. 2. Elizabeth Briggs, Cornell University. 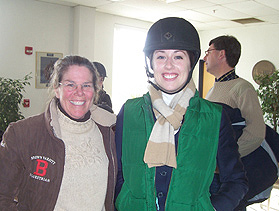 Seen here at the March 7th University of Connecticut show, Elizabeth Gilberti (on right, with Head Coach Michaela Scanlon) was one of three Brown riders to win a blue ribbon at the All-Ivies. Gilberti won the second section of open flat early in the day. Though it was thought at the time that only Gilberti and teammate Kona Shen were headed to IHSA Nationals, a Stonehill College rider at Zone 1 Zones turned out to be ineligible. Thus only a week before Nationals the Bears learned that they moved up to second at Zones and will indeed send a full team to the IHSA's year-end show April 23-26 in Murfreesboro, Tennessee. Walk-Trot Equitation On The Flat, Section A: 1. Carolyn Tsai, Cornell University. 2. Elizabeth Whitman, Columbia University. 3. Rebecca de Sa, Brown University. 4. Hyejin "Alexi" Park, Brown University. 5. Cindy Zhou, Dartmouth College. 6. Gabrielle Emanuel, Dartmouth College. Walk-Trot Equitation On The Flat, Section B: 1. Genevieve Jacobson, Columbia University. 2. Kelsey MacMillan, Brown University. 3. Natalie Colaneri, Dartmouth College. 4. Charmaine Tan, Cornell University. 5. Cale Smith, Princeton University. Beginner Walk-Trot-Canter Equitation On The Flat Championship Class: 1. Marissa Fuerst, Brown University. 2. Julia Caine, Columbia University. Walk-Trot Equitation On The Flat Championship Class: 1. Genevieve Jacobson, Columbia University. 2. Kelsey MacMillan, Cornell University. Team Totals: Cornell University (2009 All-Ivy Champion) 41; Dartmouth College (Reserve) 36; Brown University 27; Columbia University 26; Princeton University 22; Yale University 21 and the University of Pennsylvania 19.